Switched on and display cover open. 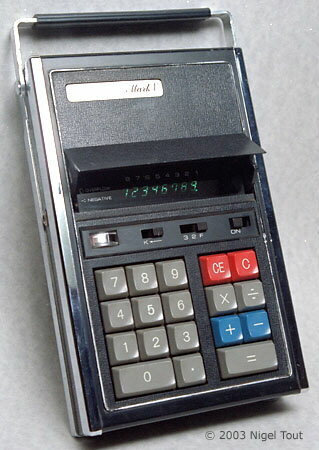 Distinctive features: One of the first of a long line of hand-held calculators from APF Corp, of New York. Has carrying handle, flip-up cover over display, battery-level meter. Display is 8 digits, green fluorescent in a single tube. 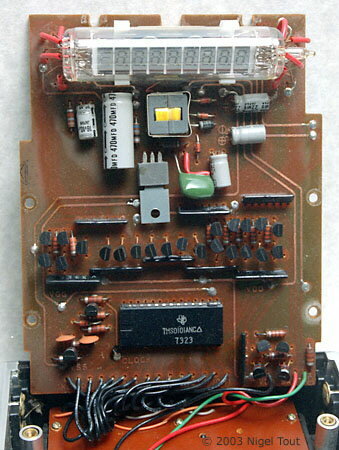 Main integrated circuit - Texas Instruments TMS0101 (date coded week 23 1973). 120 mm x 188 mm x 40 mm (4.75" x 7.5" x 1.6"). Has battery voltage meter, on left below the display. Flip up cover over display, released when the power switch is moved to the ON poistion. APF Corporation INC, New York. View inside, showing the large single display tube.